I'm not quite finished with the first pair of socks, but apart from the nervous moments around the short-row heel in the pattern I chose I've enjoyed them a lot. I totally get what the fuss is about now. Socks are so portable, and so compact! and it really is nice to be able to finish something quickly in very fine yarn and wear it next to your skin. But it's not just the socks... it's the fun of Stuff In The Mail. 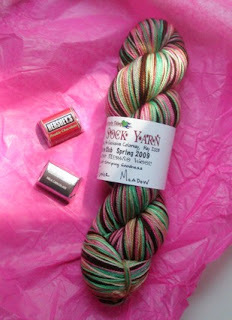 The Knitterly Things sock club is so much fun I'm going to join the Biscotte et Cie club as well. I did feel pretty irresponsible joining the sock club when I didn't even knit socks or want to start, but having thrown caution to the wind, I am thinking that with the new skein I need solid heels and toes. I should really spend that little bit more and make this new pair the most expensive socks I will ever own, don't you think? I knew you'd get it. Smart girl. Smart socks. Way smart socks. Beautiful socks! And I knew you'd catch the fever! 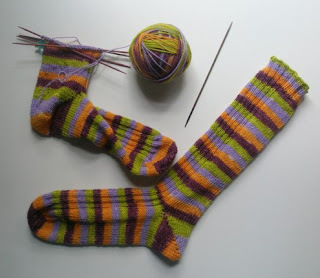 And what you need to remember about expensive handknit socks is that with reasonable care, they last forever. I have some pairs that are 8 years old and are still going strong.